Back in Guinob-an, it was still tense, and in August 1985, a few weeks after we returned, the Mayor of Lawaan, Pio Diasanta, made a trip to Guinob-an to inspect a road that was being built between Guinob-an and Amanduraga Falls. The government was planning to set up a power plant by the waterfall. While in Guinob-an he was ambushed and killed by the NPA as part of their “revolutionary justice” against government officials whom they claimed were corrupt. This assassination was a big shock, and one of the people involved was someone we all knew who was from Guinob-an. 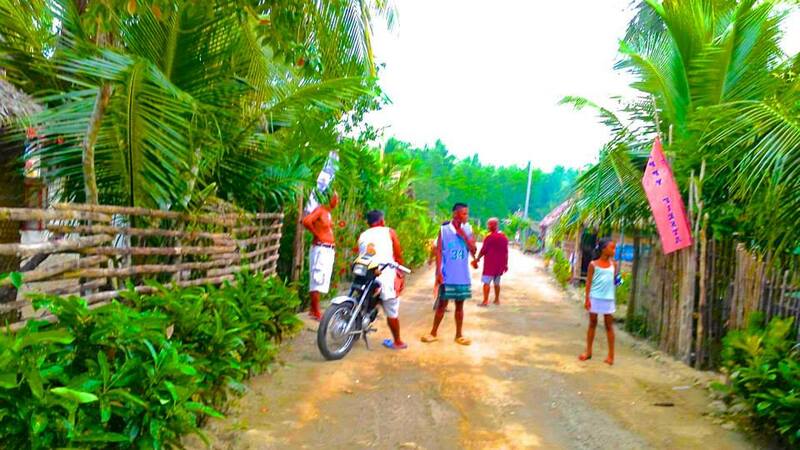 Again, the military stepped up its pressure on Guinob-an and its residents. But this time, fortunately, there was a new commander of the military and although he was strict, he kept better control of his men, with the result that there were no longer incidents of petty harassment, like the incident with the camouflage jacket. Meanwhile, I had missed all of third grade. We start going to school at seven, which is why I was in third grade at the age of 10. We graduate in ten years. So now, after the time on Homonhon, I was a year behind in school. I was happy to be back in school. The elementary school in Guinob-an had two rooms; one for first and second grade and the other for third and fourth grade. When you reached fifth grade, you went to Lawaan where there was a larger elementary school and a high school. What I remember of the education I got in Guinob-an is very basic—knowing numbers, knowing how to spell words, learning how to count and add. English was a subject but it was just learning how to spell and pronounce. Nothing too much about history or the outside world was taught. It all added up to a life where my world was Guinob-an and the adjacent towns, the poblacion of Lawaan, and that was it. Guiuan was the biggest town I had seen. I had not been to Tacloban City yet; that would come later. I finished third and fourth grade in Guinob-an. My third and fourth grade teacher was Ate Annie, whom I remember as being very nice. She was single, skinny like me, kind of pretty. She was from Bolusao, and so during the lunch break she stayed at school. She had a suitor who would come into the school once in awhile, and they would talk during the break. During those break times when he would come, she would tell us: “Go to sleep!” and we would be giggling, talking about the boyfriend, and she would say again: “I told you to go to sleep!” and everyone would laugh. I’m pretty sure I was one of her favorite students. When Ate Annie needed to go meetings at the main office of the elementary in Lawaan, I would go with her. At that time we had to walk, about 45 minutes to get to Lawaan. Everyone walked everywhere. Some people had bicycles; very few had motorbikes. At one point we had a bike and my mom would make me ride it to Bolusao to buy rice because in Bolusao rice cost about one peso less per kilo. I would take my little niece with me—the bike had a little wooden seat where she could ride, and I would pedal to Bolusao, buy three kilos of rice, hang it on the front of the bike, and pedal back. With the money we saved my mom could buy oil for cooking or kerosene for lighting so I could do my homework at night. I was very skinny, very athletic and very active. In those days I definitely did not think of myself as pretty; in fact, I never tried to do any of the “pretty girl” activities, partly because those activities —like marching in the parades with batons as a majorette— required a uniform and we couldn’t afford that. I remember seeing the majorettes in the fiesta, in the parades, with their sparkly uniforms and their makeup; they looked so beautiful. Although we didn’t need a lot of money to live as we did, we did need some, and the only way we could get any cash at all was to sell fish, tuba, vegetables or cooked food to villagers who were better off financially than we were. My father sold the tuba and my mom sold the cooked food. My “department” was selling fish. I was a prime target because I was the youngest of the siblings but oldest of the “second generation” of kids then living in the house, so I was both the baby and a responsible supervisor of the second wave. When Tatay, who fished traditionally with a hand-line and hook, or brother Ronnie, who was a spear-fisherman, brought home the catch, if the fish were small my mom and I would select the best fish, then string them through the gills onto a string. The smaller fish were sold whole; sailfish and marlin were cut into pieces and strung together; the string was tough enough to hold the pieces in place. Sometimes my mom would just put the big fish on a plate but that was harder for me because you can only carry two plates. It was much easier to carry fish on a stringer. Other times, I would be asked by one of the other mothers to sell fish for them—and when I did this, they would give me a few pesos from the sales, which was exciting and made it seem like fun. The last thing I remember from this period is my best friend Onyang. Her real name was Luzviminda Abayan, but we called each other sangkay, meaning friend, even though I’m pretty sure we’re cousins. Onyang was the youngest of five children, all living at home, and as a result she got to play all the time and had few household chores because the older siblings were around to do the work. I was jealous because I was the youngest in my family too, but I had more chores than anyone because the older siblings had escaped to their own homes, and the second-generation nieces and nephews weren’t old enough. When Onyang’s parents went to their farm in the hills, they always brought Onyang, and she always asked me to go with her. I had to ask permission from my mom, and sometimes she would say yes. Whenever she did, I went with a big smile on my face, partly because it was fun and mostly because it meant I had escaped my household chores for the day. I loved it when I was with Onyang at their farm plot—always playing, no danger of hearing “Rena!” followed by an order to do some work. We enjoyed long, beautiful days playing games, hunting for guavas or ripe papayas, and one time we built a tiny little bahay bahayan house. Sometimes we would cook our own lunch of fresh sweet potatoes or cassava. Other times we would put out bird traps to catch ground birds—ngurukuru—which look a lot like pigeons and sound like them. In fact, it’s name sounds like the sound it makes. And all the time, we would munch on anything we could find. My favorite was to dig up their peanut plants and eating the green peanuts fresh out of the ground. Those were perfect, beautiful days; long and unhurried, filled with laughter and friendship and discovery, immersed in nature with no thought beyond the moment. I want so much to feel carefree like that again just once in my life. Maybe someday, when I’m old, I can do it again, just like we did back then, not a care in the world beyond the natural things around us, the friendship, the warm breeze blowing up from the water, sunlight dancing through the trees, peanuts, guava, papaya—I can’t imagine how success and wealth could ever equal what I felt those days, and hope to feel again someday. Until that day, if it ever comes, I can dream about it and try to feel it again. If I close my eyes I can almost feel it.